The crock pot really gets going in the fall in our house; once it starts to get chilly out, we often start throwing in the beef stroganoff or some other fairly hearty dish. Trouble is, it’s often really heavy, too. There are times when I just don’t want a crock pot meal that weighs me down. CSA week 1 brought us sweet potatoes, so I decided to make a crock pot that capitalizes on those. Since we got apples, too, adding those into the mix seemed like a logical next step. And let’s toss in the red onion we got, as well! The more the merrier! This crock pot meal meets most of my typical requirements: easy to prepare, cooks well, and doesn’t break the bank. If your grocery store does BOGO on pork tenderloin (which ours does on a semi-regular basis), consider picking up a couple and then freezing one. It only takes a day or so to thaw out a tenderloin, and you can save money while you eat a tasty dish. 1. Coat the inside of a 5qt crock pot with non-stick spray. 2. Add the potatoes and onion to the crock pot. Place the pork on the bed of potatoes and onions. 3. Grind or sprinkle a small amount (each) of salt and pepper on top of the pork tenderloin. If using a grinder, a few grinds should do the trick. 4. Pour the apples on top of and around the pork tenderloin. 5. In a bowl, stir to combine the apple juice, brown sugar and cider vinegar. Once combined, pour over top of the items in the crock pot. 6. Cover and cook on LOW for 6-8hrs. 7. 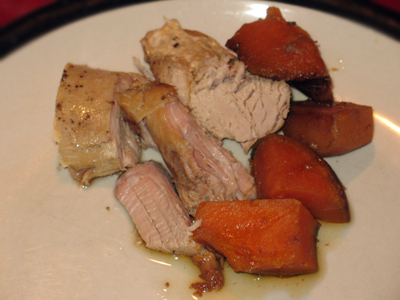 When done, remove the pork tenderloin from the crock pot and place on a cutting board to rest for 5-10 minutes. 8. Remove the potatoes, onions and apples and place in a serving bowl; remove the juices and put in a gravy boat or other easy serving vehicle. Slice the pork tenderloin into 1/2 – 3/4in slices, serve with the potato/onion/apple mixture, with sauce over top. This entry was posted in crock pot cooking, entrees, locavore and tagged cooking, crock pot, crockpot, CSA, eat local, locavore, meals, vegetables by crunchymetromom. Bookmark the permalink. I am stoked to see your crock pot recipes. I need to get ours cranking again this fall (mainly for the boys since I’m a veg-head), but my arsenal of slow cooker emails is very thin.